On this page you will find some of my favorite Dutch Products. There are a few real "Dutch specials" like "Hagelslag", which is a kind of chocolate vermicelli, but you will see also my favorite peanut butter. This one really taste to peanuts. It is also without a lot of additional stuff inside, it is just like your grandmother made it her self. The price is also very good: the last time I bought it was on 13 April 2002 at the ALDI supermarket, Gaaspstraat 41 Amsterdam. The price for one jar of 320 grams is only 52 Eurocent. In Swiss franc this is about 80 centimes. This is much cheaper then I pay for the peanut butter at the MMM Migros in Switzerland, there I pay CHF 3.20, about Euro 2.13 for the same quantity, but without the same very good taste. For the Dutch readers, here is an interesting Peanut butter link. There is also an English section. First you have to buy the peanut butter! 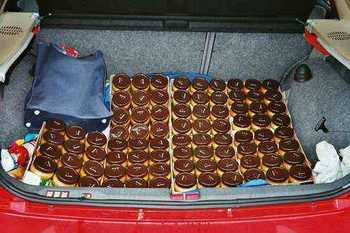 Then put it in the car. This is really a specific Dutch product. 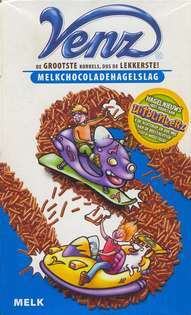 It is called "Chocolade boter", in English "chocolate butter". I've never seen something like this in other countries. It is made of chocolate and you can spread it on your bread. It has a very good taste and it is really something special. My last paid price was Euro 2.59. at the A&P in the Amsterdamstraat 54, Haarlem. It is not so easy to find a shop where they sell it, but all these A&P shops seems to have it. It is produced by "Brinkers", at Enschede, a city in the Eastern part of Holland. 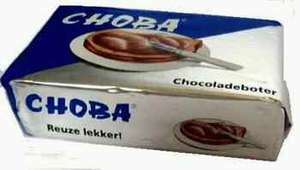 CHOBA is a product that they manufacture, distribute and export since 1946. This is the French side of "Choba". It is done for the Belgian market. "Ça c'est bon" means that is very good. This is another special Dutch product. The one I like the most consists of milk chocolate. There is also a "pure" version. There are some different sizes. My favorite one is very large; it contains 600 grams of Hagelslag. The last price I paid was 1.50 Euro, on 13 April 2002 at the Makro Amsterdam.